Network Supercar DVD Set (UK) released in April 2005. Full Boost Vertical! - The Making of Supercar Documentary DVD from 10th Planet in UK and FAB Gear in USA. Product Enterprise Diecast Supercar from 10th Planet in UK and FAB Gear in USA. (Available in the UK via Star Trader - mention this web site for offers). A & E Supercar DVD Set (USA) released May 2003. Includes Black Rock Desert and Laboratory scenery. 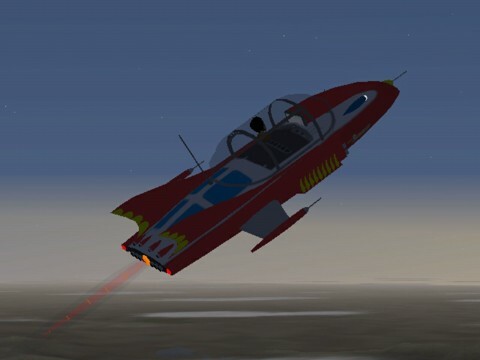 Version 2.2 available for Flight Simulator 98 and CFS. See also Flight Sim Model - The Supercar Challenge, Height and Speed Records and the Area 51 Challenge. (Cinema 4D, Studio 3D Max, 3D Studio Release 4, LightWave 3D, trueSpace, AutoCAD DXF and Poser 4 models available). 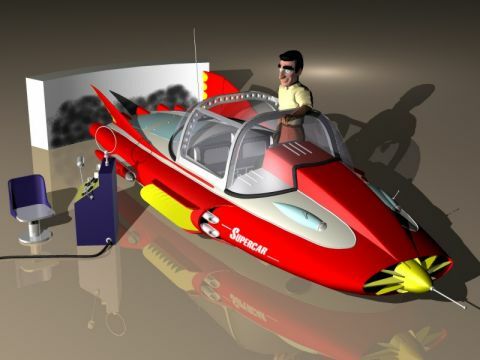 A low resolution mesh suitable as the basis for 3D models of Supercar for games is available. See the Orbiter Spaceflight Supercar release build directory. Supercar: Take Two - a project to collaboratively develop a new Supercar storybook. ITV/Granada are copyright owners for Supercar. They are not associated with this world wide web site. This is a fan maintained page intended to promote the shows of Gerry Anderson. Care has been taken to avoid the use of copyright images and other materials, but concerns over unsuitable use of materials, or suggestions for improvement on this page should be sent to Austin Tate <a.tate@ed.ac.uk>. Thanks to Keith Wilson of Mayhem Comics <kez.wilson@gte.net> for producing the title graphic. An Index to all Gerry Anderson-related pages at this site is available.